SPACE PLANE X-37B: The US Air Force's X-37B space plane is making a series of passes over North America this weekend. It shines about as brightly as the stars of the Big Dipper as it glides across the night sky. You can find the X-37B on your iPhone or check our Simple Satellite Tracker for flyby times. 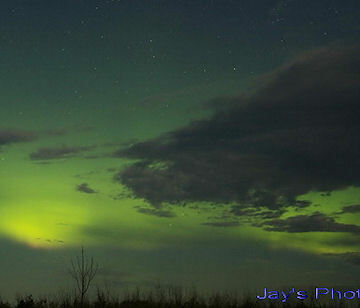 "The auroras were amazing last night," says photographer Jason Exferd of Iron River, WI. "I took this 13-second exposure using my Canon Rebel XS." The storm has subsided now. The next storm is due on May 31st or June 1st when a solar wind stream is expected to hit Earth's magnetic field. Would you like a call when the action begins? Sign up for Spaceweather Phone. The trick, says Ayiomamitis, was focusing. "Focusing the telescope was very difficult against the mostly-blank blue sky. And there were no big sunspots I could use to fine-tune the focus by observing the sun. I got very lucky!" His photo shows that with ISS construction now mostly complete the space station subtends an angle bigger than the biggest planet. "Jupiter has an apparent diameter of 37.5 arcseconds, which is second to the passing ISS at 42.1 arcseconds," he notes. 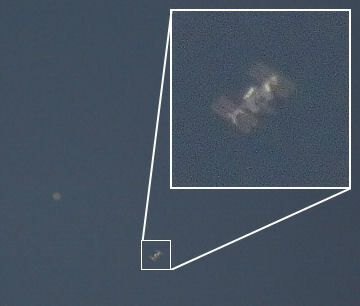 Last week he also photograpphed the space station transiting the sun. "Broad daylight is an interesting time for ISS photography," he says. Blue-sky transit forecasts may be found at calsky.com. On May 30, 2010 there were 1127 potentially hazardous asteroids.